I had the privilege to know the star acting horse appearing in this film and to become friends with the family that took care of him for the rest of his life. 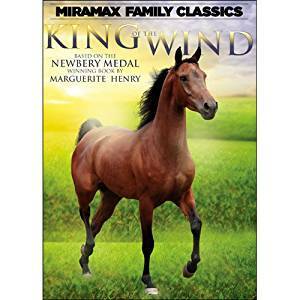 Based on the Newbery Medal-winning novel by Marguerite Henry, King of the Wind is a magical story of friendship and adventure starring a delightful cast of Richard Harris, Jenny Agutter and Nigel Hawthorne. An Arabian colt named Sham—born with both the mark of good and evil—becomes the companion of Agba, a young, mute boy. Sent away to France as a gift, Agba refuses to leave the horse's side and together the two begin a remarkable journey. Despite setbacks along the way, Agba pushes on, keeping his promise to provide the best care for his friend. As Sham grows, his speed and agility improve, and he becomes not only one of the best friends a boy could have, but also a skilled thoroughbred.